I made a boo-boo at work yesterday. The client I was working with was very understanding, forgiving, and even accepted some of the blame. But I felt pretty rotten about the oversight. Now, I’m not a perfectionist because done is better than perfect. But I couldn’t shake my disappointment of letting them down. So much so that I continued to worry about my mistake into the night. Then I awoke to the above new sign on display in our kitchen today, which was ironically crafted by my eight year old daughter. It immediately cheered me up. Partly because I learned some things from my mistake and instituted two immediate changes that will make me a better writer. 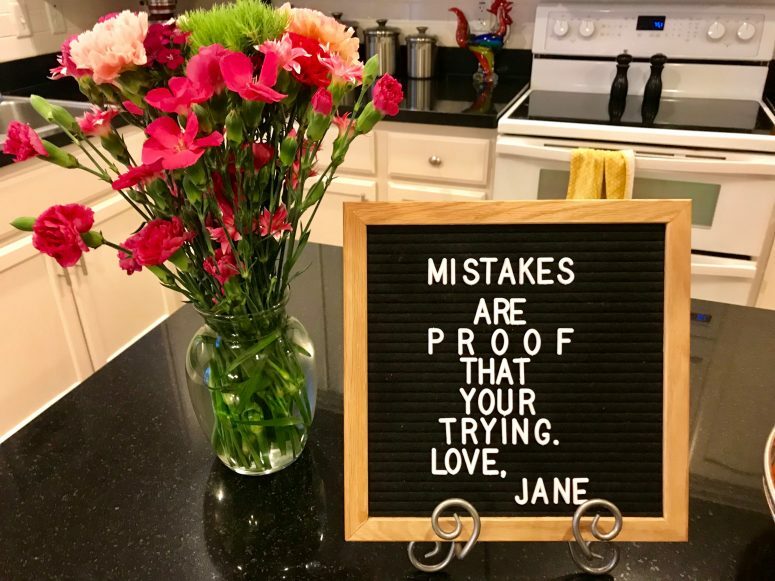 But also because the sign reminded me that it’s okay to make mistakes sometimes. Showing up really is half the battle. As my friend David says, “You gotta play some sour notes in order to make your sound sweeter.” I’m grateful of those simple truths that make moving on, closure, and even improvement possible.